Do brands understand why people choose one piece of content over another? What drives them to like a piece of content, or love it? Could the psychology behind these decisions give brands the edge in a data-saturated market? AOL has found some answers. 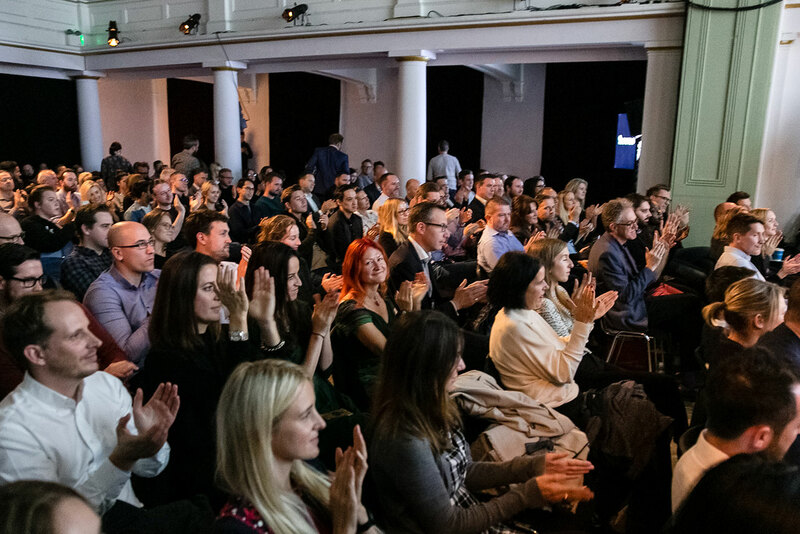 AOL set out its core vision to a packed room at their 2016 IAB digital upfronts session: build brands people love. 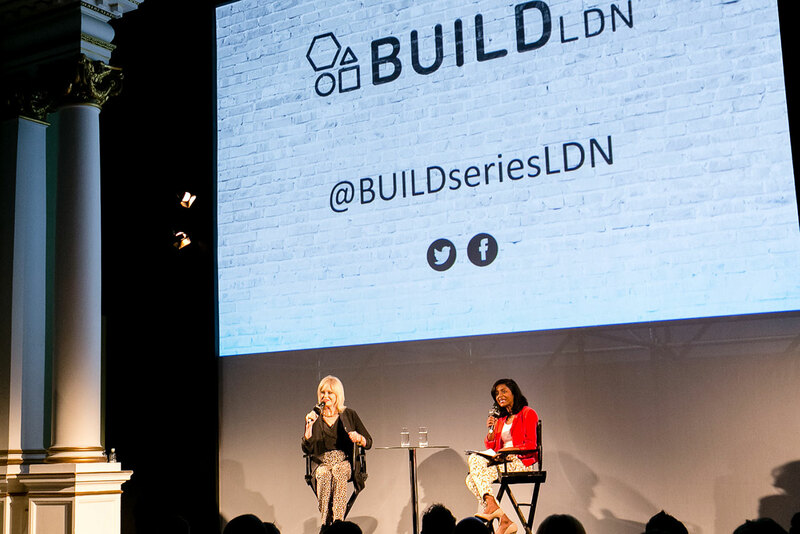 Stuart Flint, managing director of AOL UK, explained the importance of brand love: "Airbnb is a business worth $30 billion, yet all they own is trust and connections. When I think about the brands I love, that resonates because I trust and connect with those brands. That’s the role of love in a modern business." AOL’s revealed its ambition is to reach two billion global users by 2020. So how do they plan to tackle the challenge? By getting to grips with consumer psychology. Advertisers are inundated with data about their target audiences, but rarely think about the reasons consumers actually interact with content in the first place. The session explained that if brands can understand the ‘why’, they can align it more to individual consumer needs. 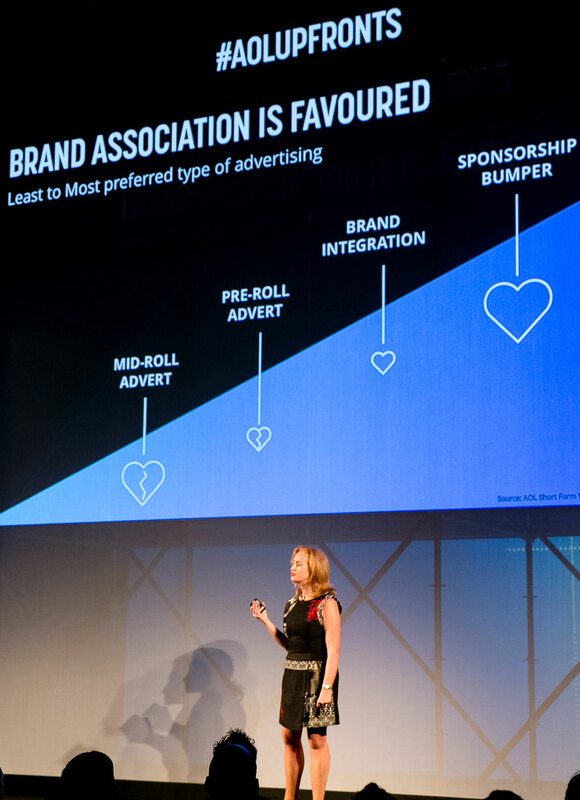 AOL’s head of international research, Anita Caras, revealed AOL Advertising’s latest insights: eight moments to help brands understand why consumers engage with online content. ‘Content moments’ help brands optimise according to in-the-moment consumer behaviour; by getting the right type of content to people in the right way, brands can create branded experiences that people genuinely love. The UK stands out from the other countries with more ‘Social’, ‘Be in the Know’ and ‘Comfort’ moments, compared to global averages. UK consumers are spending longer in moments such as ‘Entertain’ (16 mins on average) and ‘Connect’ (13 minutes on average), looking for relaxation and escapism. Women enjoy more "lean-back" moments such as ‘Inspire’ and ‘Social’, while men tend to ‘Connect’, gravitating towards content they can share. Driven by distraction, a wish to try something new, or to be shocked and amazed, UK millennials are much more likely to have ‘Inspire’ and ‘Connect’ moments. Moment types vary according to the time of day and day of the week. UK consumers spend nearly twice as long in a moment later in the evening (14 minutes on average between 8-11pm) than they do in the morning (9 minutes on average between 9am-12pm). During the week, consumers want to stay updated on current affairs, researching something specific or seeking moments to take a mental break. So, they are more likely to be in intent-based moments such as ‘Update Socially’, ‘Be in the Know’ and ‘Find’. At the weekend, consumers are more attracted to emotional and entertaining moments such as ‘Comfort’, ‘Connect’ and ‘Feel Good’. 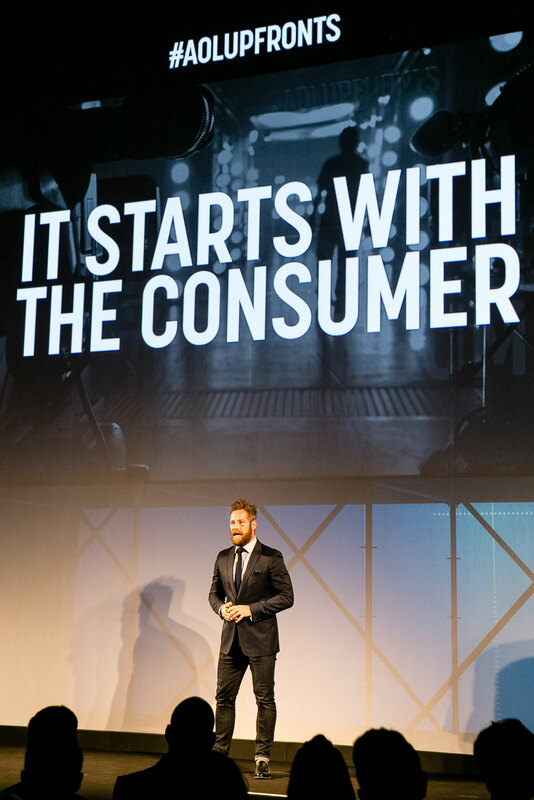 Mark Melling, director of video at AOL Europe, demonstrated how brands can influence consumer psychology from the start. He explained how one of AOL’s leading brands, The Huffington Post, connects with readers (and builds brand love) through it’s ‘What’s Working’ initiative. ‘What’s Working’ is their commitment to solutions-based journalism. HuffPost shines a light on real stories of creativity and compassion, and the good people finding solutions to the world’s problems. Consumers crave this simplicity and positivity in a complex environment. ‘What’s Working’ articles receive over 70% more visits than the average article and 86% more visits from social media, showing that this philosophy resonates with readers. 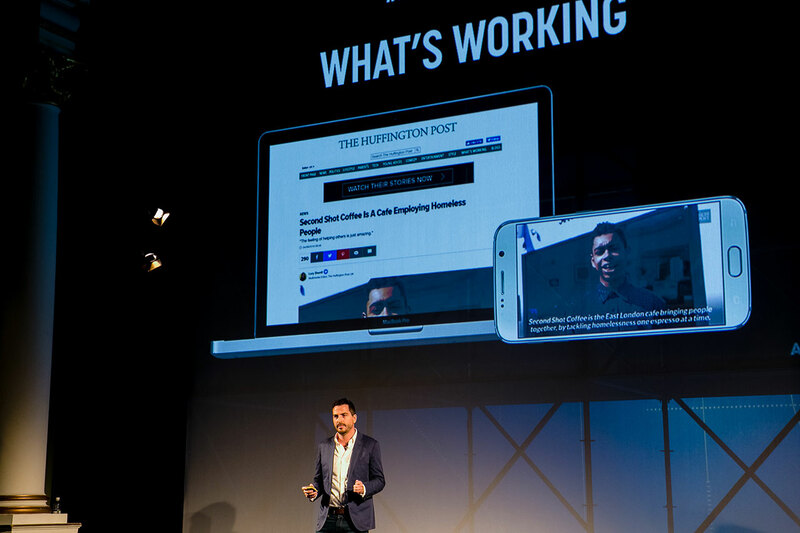 Melling also showcased some of AOL’s original content for 2017, which embodies their 'What’s Working’ philosophy. They include 'Fearne on Fashion’, 'Tech Hunters’, 'The Chefs’ Chef', 'The New Activists’ and 'Antarctica: The Last Wilderness'. 'Antarctica: The Last Wilderness' – British explorer Robert Swan, the first person to walk unaided to the North and South Pole, goes on location in Antarctica to demonstrate the importance of renewable energy. The video series enforce what Melling called AOL’s "commitment to inspiring, entertaining narratives that tell positive stories". 38% of people say that when they share video content online, it says a lot about them. "Patsy usually starts the day off looking pretty good but by the evening begins to unravel." "I filmed the pilot for the part of Patsy but couldn’t seem to make Jennifer smile… I said to my agent she clearly doesn’t like me, I'd better pull out." "We have some researchers who go out first. There’s nothing more irritating than getting there and the tribe you were going to interview has moved to a different hillside." "You should never think ‘what’s left for me to do?’… The world is left to do! The more you’ve travelled the more you realise how much there is to see." "Examine what other people do. It always irritates me when people say: ‘Oh we’ve always voted for so-and-so.’ Have you even read the other manifestos?" "Figure out who is admirable. Don’t just do stuff in a tribal way." "The world is turning faster and there are far more dangers. Or maybe we just know more and people can react faster. We don’t have time to debate fully what is going on." "I would announce that I am now a benevolent dictator. For the next three years there would be no talk about what I wanted to do… it would be done."